Francesc is a solitary thirteen-year-old boy who finds by chance the book The myth of Sisyphus by Albert Camus in school. Fascinated by the philosopher's ideas, he decides to become an existentialist, raises his coat collar and starts calling himself Jean-François. He sets his mind on going to Paris to meet Camus. Lluna, a teenage girl older than him who lives in the present, agrees to go with him on one condition: they must make a stop on the way to see the French boy she had an adventure with last summer. Jean-François and Lluna take off to discover the sense of life, with or without Camus. Francesc is a kid from Barcelona, who has recently turned thirteen. He is pale, skinny, a little awkward, introverted, tidy and thorough. The doctor makes him wear an eye-patch, and he is a bullied in school. Because of all this, he daydreams about his suicide and funeral. When by chance he finds the book "The Myth of Sisyphus" by Albert Camus, he feels it speaks directly to him. He does not agree with the philosopher, but nevertheless he feels a strong connection with the writer. So, he decides to become an existentialist, asks to be called Jean-François and travels to Paris to meet him. Lluna is seventeen-year-old girl, who is going through a difficult time. Her parents, teachers and everyone around her seem to have a plan for her. And they don’t’ seem to care about her opinion. Only Philippe, a French guy with whom she had an affair during the summer, seemed to really understand her. When she meets Francesc and learns that he has the money to go to France, she doesn't feel bad for taking advantage of him. To a certain extent, she is also helping him by going with him to Paris. Sergi Portabella graduated in ESCAC, in Cinematography, and later he decided to focus in writing and directing. He has since then worked as a director of short films, music videos, a TV series, book-trailers, making of’s, and as scrennwriter for other series like KMM from Televisió de Catalunya and its adaptation into graphic novel. He has written and directed the short films TE QUIERO (2009), THE ASTRONAUT ON THE ROOF (2010) and EL FIN DEL MUNDO SERÁ EN BRASIL (2013) that have been selected in more thatn 250 film festivals and received more than 75 international awards. “Jean-François and the Meaning of Life” is born from experiences from my own childhood and adolescence. I wanted to portray the feeling of that time, when I was trying to find my way and make sense of the world. Everything that was happening to me was happening for the first time. Every little adventure, conversation or reading felt so important and life-changing. Every little thing seemed to have an enormous impact on my future and the construction of my personality. In that moment, finding out a meaning for life was a very immediate matter that required an urgent solution. 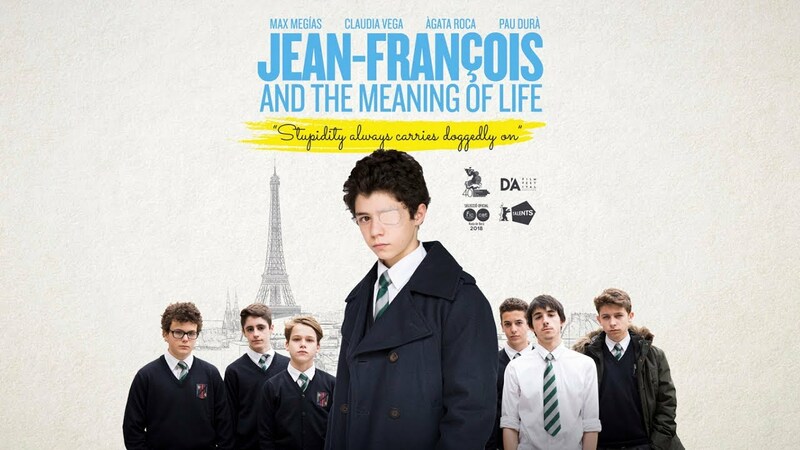 “Jean-François and the Meaning of Life”, the first feature film by writer-director Sergi Portabella, it’s produced by A Contraluz Films and El sentit de la vida AIE, in coproduction with Surprise Alley (France), in associate production with Televisió de Catalunya, with the participation of Televisión Española, and with the support of ICEC, ICAA and the Creative Europe – MEDIA Programme of the European Union for its development. Sergi Portabella was selected with this project in the Berlinale Talents Script Station 2014. The film will premiere in Spain on 2018, distributed by Vercine and Filmin. A Contraluz Films (Barcelona, Spain) is focused on producing fiction and documentary feature films, author-driven with a commercial and international ambition. Its films have premiered in film festivals like Cannes, Sundance, Warsaw, South by Southwest, Karlovy Vary or Malaga, and have received several awards and nominations. Main filmography includes the film “The Corpse of Anna Fritz” (2015), “Estrella” (2013), “Carmo” (2009), “Savage Grace” (2007) and “School’s out” (2005). Surprise Alley (Paris, France) produces feature films, exploring new narrative and aesthetic perspectives with directors of various cultural and artistic backgrounds. Teamed up with international senior producers, it’s actually involved in several projects in coproduction with countries like Spain, Germany, Chile, Lebanon and Iceland, and it’s developing own projects.